Shall I go or stay? 席をはずしましょうか, それともここにいましょうか. I have no time to stay. 長居する時間はない, こうしてはいられない. Stay here till I return. 私が帰ってくるまでここにいなさい. I stayed at home [in bed] all day. 一日中家に[床について]いた. How long can you stay underwater? どのくらい水中にもぐっていられますか. My socks won't stay up. ソックスがどうしてもずり落ちてしまう. I keep replacing the plug but it won't stay in. プラグを何度差し込んでもすぐに抜けてしまう. Stay where you are. そのままそこにいなさい. He stayed to see which team would win. 彼はどちらのチームが勝つか見ようとしてい残った. Please stay for [to] dinner. 夕食までゆっくりしていてください. stay (for) a month 1か月滞在する. stay the night その晩泊まる 《★【用法】 the night は副詞句》. I don't live here; I'm just staying (for) a while. ここの者ではありません, 一時滞在しているだけです. He stayed at the hotel [in New York]. 彼はそのホテルに宿泊した[ニューヨークに滞在した]. I'm staying with my uncle. おじの家にやっかいになって[同居して]いる. The weather stayed hot for a week. 1週間暑い日が続いた. How long are you going to stay a student? いつまで学生のままでいるのですか. Go west and stay on this road until you reach the gate. 西に行って門に達するまでこの道をずっと進んでください. I'll stay judgment till I hear the other side. もう一方の言い分を聞くまで裁断をのばそう. stay the spread of a disease 病気の蔓延(まんえん)をくい止める. stay one's hunger [thirst] 一時的に空腹[渇]をいやす. stay the course (競走で)完走する; 最後までがんばる. make a long stay 長滞留する. have an overnight stay at Banff バンフに 1 泊する. He checked into the Grand Hotel for a three‐day stay. 彼は 3 泊しようとグランドホテルにチェックインした. 不可算名詞 [具体的には 可算名詞] 【法律, 法学】 延期，猶予. (a) stay of execution 死刑執行の延期. He's the stay of my old age. 彼は私の老後のつえ(と頼む人)だ. Don't stay too long at the party. Few members wanted to stay after the meeting. I will stay to see you are all right. She is staying at a nearby hotel. How long are you staying in Tokyo? The weather will stay fine. He stayed angry at her for weeks. That pub stay open until midnight. I stayed the night at his house. A slice of toast will stay your hunger for a while. I had to stay in and take care of my baby. You can stay in the car if you want. Please go ahead; I'll stay behind . Those pubs stay open until midnight. These animals have to stay still to conserve energy. What we should do is stay united. This agreement will stay in force for a century. stay a day or two. We invited Ricky to stay overnight. From Middle English steyen, staien, from Old French estayer, estaier (“to fix, prop up, support, stay”), from estaye, estaie (“a prop, stay”), from Middle Dutch staeye (“a prop, stay”), a contracted form of staede, stade ("a prop, stay, help, aid"; compare Middle Dutch staeyen, staeden (“to make firm, stay, support, hold still, stabilise”)), from Old Dutch *stad (“a site, place, location, standing”), from Proto-Germanic *stadiz (“a standing, place”), from Proto-Indo-European *stéh₂tis (“standing”). 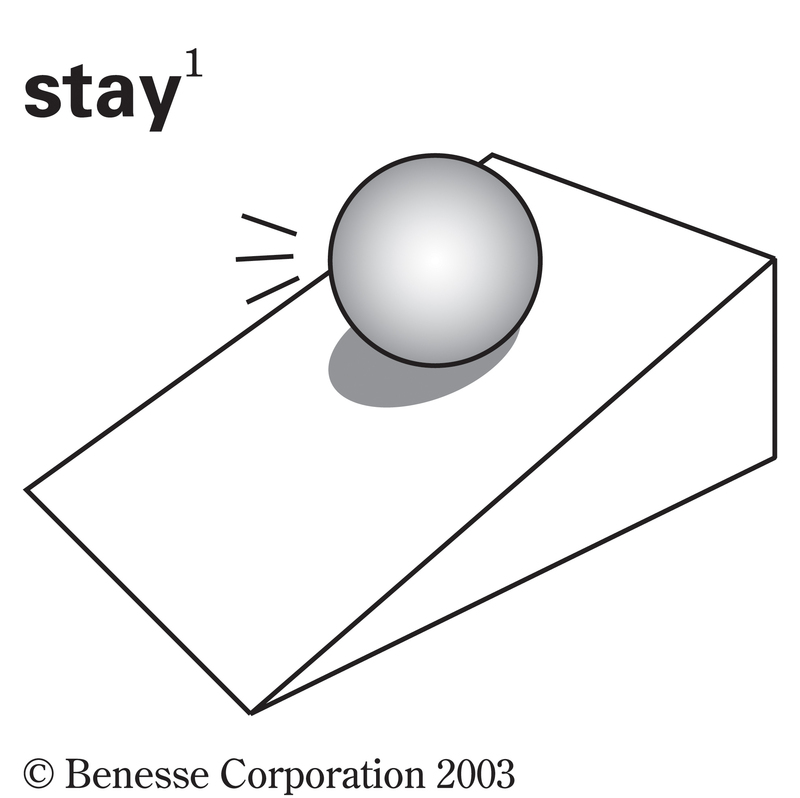 Influenced by 古期英語 stæġ ("a stay, rope"; see below). Cognate with 古期英語 stede, stæde (“a place, spot, locality, fixed position, station, site, standing, status, position of a moving body, stopping, standing still, stability, fixity, firmness, steadfastness”), Swedish stödja (“to prop, support, brace, hold up, bolster”), Icelandic stöðug (“continuous, stable”). More at stead, steady. Sense of "remain, continue" may be due to later influence from Old French ester, esteir (“to stand, be, continue, remain”), from Latin stāre (“stand”), from the same Proto-Indo-European root above; however, derivation from this root is untenable based on linguistic and historical grounds. An alternative etymology derives Old French estaye, estaie, from Old Frankish *staka (“stake, post”), from Proto-Germanic *stakô (“stake, bar, stick, pole”), from Proto-Indo-European *(s)teg- (“rod, pole, stick”), making it cognate with 古期英語 staca (“pin, stake”), 古期英語 stician (“to stick, be placed, lie, remain fixed”). Cognate with Albanian shtagë (“a long stick, a pole”). More at stake, stick. (transitive) To prop; support; sustain; hold up; steady. Draw in your right elbow, turn your hand outward and bear it lightly, gripe not the pen too hard, with your left hand stay the paper. To stay thy Vines and fence thy fruitful Ground. (transitive) To support from sinking; to sustain with strength; to satisfy in part or for the time. (transitive) To stop; detain; keep back; delay; hinder. Your ships are stay’d at Venice. The task of recalling him from the vagrancy into which he always sank when he had spoken, was like recalling some very weak person from a swoon, or endeavouring, in the hope of some disclosure, to stay the spirit of a fast-dying man. She rose to leave but Libor stayed her. (transitive) To restrain; withhold; check; stop. So David stayed his servants with these words, and suffered them not to rise against Saul. […] you must follow the impulse of your own inspiration. If THAT commands the slaying of the victim, no bystander has a right to put out his hand to stay the sacrificial knife: but I hold you a stern priestess in these matters. (transitive) To cause to cease; to put an end to. (transitive) To put off; defer; postpone; delay; keep back. The governor stayed the execution until the appeal could be heard. Without one word to deny himself, Yuan let himself be bound, his hands behind his back, and no one could stay the matter. (transitive, obsolete) To bear up under; to endure; to hold out against; to resist. (transitive, obsolete) To wait for; await. (transitive, obsolete) To remain for the purpose of; to wait for. (intransitive, obsolete) To rest; depend; rely. (intransitive, obsolete) To stop; come to a stand or standstill. (intransitive, archaic) To come to an end; cease. That day the storm stayed. (intransitive, archaic) To dwell; linger; tarry; wait. Yet not to be wholly silent of all your Charities I must stay a little on one Action, which preferr’d the Relief of Others, to the Consideration of your Self. (intransitive, dated) To make a stand; to stand firm. (intransitive, obsolete) To hold out, as in a race or contest; last or persevere to the end. (intransitive) To remain in a particular place, especially for a definite or short period of time; sojourn; abide. We stayed in Hawaii for a week. I can only stay for an hour. I stay a little longer, as one stays / To cover up the embers that still burn. (intransitive, obsolete) To wait; rest in patience or expectation. I’ll tell thee all my whole device / When I am in my coach, which stays for us. (intransitive, obsolete, used with on または upon) To wait as an attendant; give ceremonious or submissive attendance. (intransitive) To continue to have a particular quality. Wear gloves so your hands stay warm. The evergreen arch wouldn’t stay firm after she got it up, but wiggled and threatened to tumble down on her head when the hanging baskets were filled. The three men in the room stayed motionless, holding their breaths. The dirty secret of the internet is that all this distraction and interruption is immensely profitable. Web companies like to boast about […], or offering services that let you "stay up to date with what your friends are doing", […] and so on. But the real way to build a successful online business is to be better than your rivals at undermining people's control of their own attention. Hey, where do you stay at? Continuance or a period of time spent in a place; abode for an indefinite time; sojourn. I hope you enjoyed your stay in Hawaii. A postponement, especially of an execution or other punishment. The governor granted a stay of execution. (archaic) A stop; a halt; a break or cessation of action, motion, or progress. Made of sphere metal, never to decay / Until his revolution was at stay. A fixed state; fixedness; stability; permanence. (nautical) A station or fixed anchorage for vessels. Restraint of passion; prudence; moderation; caution; steadiness; sobriety. Not grudging that thy lust hath bounds and stays. With prudent stay he long deferred / The rough contention. ^ Whitney, Century Dictionary and Encyclopedia, stay. From Middle English stay, from Old French estaye, estaie (“a prop, a stay”), from Middle Dutch staeye (“a prop, stay”), a contracted form of staede, stade ("a prop, stay, help, aid"; compare Middle Dutch staeyen, staeden (“to make firm, stay, support, hold still, stabilise”)), from Old Dutch *stad (“a site, place, location, standing”), from Proto-Germanic *stadiz (“a standing, place”), from Proto-Indo-European *steh₂- (“to stand”). See above. My only strength and stay. Even when the deceptive mask was torn away, and the broken-hearted parent, beholding the accursed fact, that his darling son, the fancied stay of his declining age, was enlisted against him in his brother's horrible revolt, cursed them both and died, not even then did one compunctuous visiting touch his callous heart. A piece of stiff material, such as plastic or whalebone, used to stiffen a piece of clothing. Where are the stays for my collar? Her figure was tall, yet not too tall; comely and well-developed, yet not fat; her head set on her shoulders with an easy, pliant firmness; her waist, perfection in the eyes of a man, for it occupied its natural place, it filled out its natural circle, it was visibly and delightfully undeformed by stays. (archaic) A fastening for a garment; a hook; a clasp; anything to hang another thing on. From Middle English stay, from 古期英語 stæġ (“stay, a rope supporting a mast”), from Proto-Germanic *stagą (“stay, rope”), from Proto-Indo-European *stek-, *stāk- (“stand, pole”), from Proto-Indo-European *steh₂- (“to stand”). Cognate with Dutch stag (“stay”), German Stag (“stay”), Swedish stag (“stay”), Icelandic stag (“stay”). (nautical) A strong rope supporting a mast, and leading from one masthead down to some other, or other part of the vessel. A guy, rope, or wire supporting or stabilizing a platform, such as a bridge, a pole, such as a tentpole, the mast of a derrick, or other structural element. The engineer insisted on using stays for the scaffolding. (chain-cable) The transverse piece in a link. (transitive, nautical) To incline forward, aft, or to one side by means of stays. (transitive, nautical) To tack; put on the other tack. (intransitive, nautical) To change; tack; go about; be in stays, as a ship. From Middle English *steȝe, from 古期英語 *stǣġe, an apocopated variant of 古期英語 stǣġel (“steep, abrupt”), from Proto-Germanic *staigilaz (“climbing, ascending, sloping, steep”), see sty. The Castle of Edr. is naturally a great strenth situate upon the top of a high Rock perpendicular on all sides, except on the entry from the burgh, which is a stay ascent and is well fortified with strong Walls, three gates each one within another, with Drawbridges, and all necessary fortifications. (Britain dialectal) (of a roof) Steeply pitched. (Britain dialectal) Difficult to negotiate; not easy to access; sheer. (Britain dialectal) Stiff; upright; unbending; reserved; haughty; proud. stay in The Century Dictionary, New York, N.Y.: The Century Co., 1911.